In a time when it is hard to find a job, manufacturing and trade jobs are abundant in todays market place. The problem is many of todays new market force don’t seem interested for one reason or another. Are you missing out on a gold mine of opportunity? Let us show you a new possibility. Student loans and college debt is slowly crushing the next generation of workers while putting a crazy strain on their lives. If we are being totally honest, college is not in the cards for everyone and it doesn’t need to be. If you like to work with your hands, have a passion for problem solving, love the atmosphere of a shop and the thought of sitting at a desk staring at a computer all day gives you an anxiety attack you may be part of what we refer to as the manufacturing Alliance. 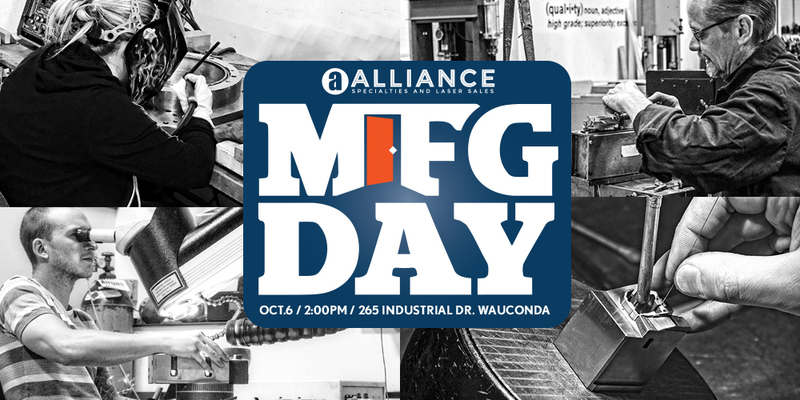 Alliance Specialties and Laser Sales is excited to open our doors to high school and colleges students, professors, instructors and parents to experience the world of hands on industrial manufacturing. Get a glimpse into what it takes to create the products that most of us take for granted on a daily basis and find out how you can jump start your career. Join us on Oct. 6th for a full shop tour throughout our entire plant. Learn how to take raw steel to a mirror finish for creating, LED’s, lenses and other high end plastic parts. Find out how we are using high powered lasers to increase productivity and efficiency in welding and engraving processes. Experience electrical wiring, thermocouples, and a 850 degree fluidized sand bath to bring old tools back to new. We will be offering multiple shop tours throughout the day as interested participants arrive. All participants and attendees should wear closed toe shoes and be ready to learn what real world industrial manufacturing looks like. We will be offering shop tours and live demonstrations in the shop throughout the day.